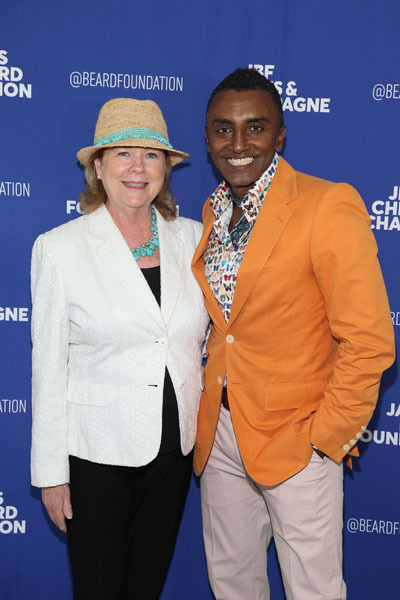 On Saturday, July 29, the James Beard Foundation (JBF) honored multiple James Beard Foundation Award–winning chef, author and restaurateur Marcus Samuelsson at its 27th annual Chefs & Champagne summer fundraiser. Samuelsson was toasted by more than 1,000 guests, who attended the sumptuous benefit at the Wölffer Estate Vineyard in Sagaponack, New York. 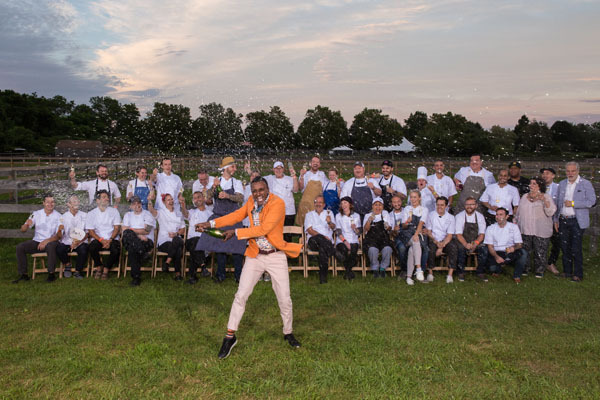 The Foundation’s tasting party featured flowing Champagne Barons de Rothschild, wines and ciders from Wölffer Estate Vineyard, and delicious tastings from a select group of over 35 chefs. 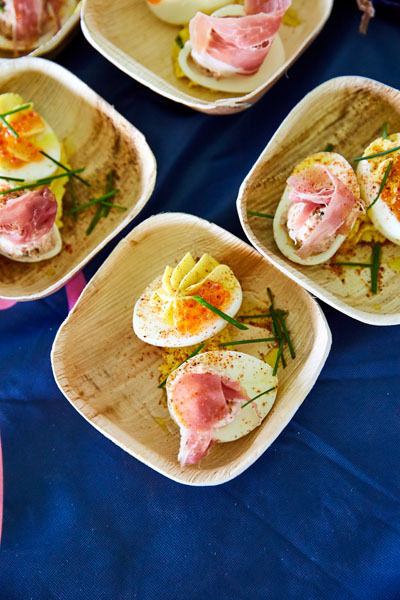 The James Beard Foundation’s Chefs & Champagne is considered the East End’s premier culinary summertime event. A silent auction consisting of one-of-a-kind dining experiences, wines and spirits, cookware, and culinary travel packages raised over $100,000 to support the JBF’s mission, scholarship, education and JBF Impact Programs, which include the annual Food Summit and Leadership Awards that help promote a better food system. Carrying on its long tradition of supporting culinary education, the James Beard Foundation was proud to announce Jordan Werner as the recipient of the 2017 Christian Wölffer Scholarship and the ICC Intensive Sommelier Course tuition waiver. Established in 2006, the Christian Wölffer Scholarship assists students in their study of food and wine. Also in attendance was multiple Christian Wölffer Scholarship recipient Christina Cassel and JBF National Scholars recipient Earlene Cruz. Chefs & Champagne participating chefs included: Matt Abdoo, Pig Beach Brooklyn, NY and Pig Bleeker, NYC; James Ahearn, Verde Wine Bar, Deer Park, NY; Greg Baxtrom, Olmsted, Brooklyn, NY; Pastry Chef Sherry Blockinger, Sherry B Dessert Studio, Chappaqua, NY and NYC; Stephan Bogardus, The North Fork Table & Inn, Southhold, NY; P.J. Calapa, The Spaniard, NYC; Denisse Lina Chavez, El Atoradero, Brooklyn, NY; Brian Cheewing, Wölffer Kitchen, Sag Harbor and Amagansett, NY; Graeme Cockburn, Windstar Cruises; Matt Conroy, Virginia’s, NYC; Philippe Corbet, Lulu Kitchen & Bar, Sag Harbor, NY; Pastry Chef Britt-Marie Culey, Coquette Patisserie, Cleveland, OH; Andy D’Amico, Marseille and Nice Matin, NYC; Tom Fraker and Marco Zapien, Melissa’s® Produce, CA; Robb Garceau, Neuman’s Kitchen, Events & Catering, NYC; Alex Guarnaschelli* and Michael Jenkins, Butter, NYC; Bryan Hunt and Pastry Chef Abby Swain, Fowler & Wells, NYC; Oliver Lange, Zuma, NYC; Shane McBride, Augustine and Balthazar, NYC; Jeffrey McInnis and Janine Booth, Root & Bone, NYC, and Stiltsville Fish Club, Miami; George Mendes, Aldea and Lupulo, NYC; Junghyun Park, Atoboy, NYC; Pastry Chef Carolina Perego, Citarella, multiple locations in NY and CT; Dominic Rice, Calissa, Water Mill, NY; Todd Richards, Richards’ Southern Fried, Atlanta; Marcus Samuelsson*, Red Rooster Harlem and Streetbird, NYC, and Marcus at the MGM National Harbor Hotel, Washington, D.C.; Chad Shaner, Freek’s Mill, Brooklyn, NY; Pastry Chef Daniel Skurnick, Le Coucou*, NYC; Roxanne Spruance, Kingsley, NYC; Fumio Yonezawa, Jean-Georges Tokyo, Tokyo; Galen Zamarra*, Mas Farmhouse, NYC, and the Halyard, Greenport, NY. 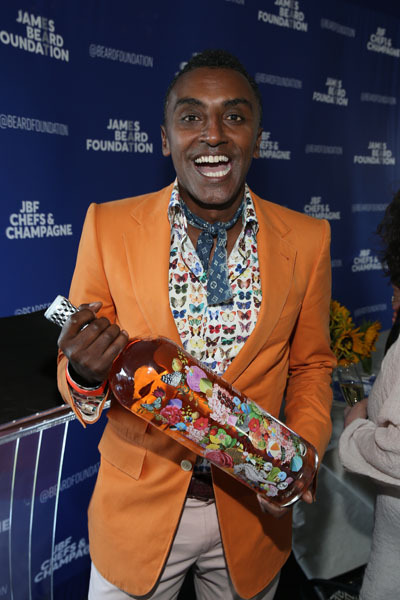 Chefs & Champagne’s guest of honor, Marcus Samuelsson, joined the ranks of gastronomic giants such as Bobby Flay, Thomas Keller, Emeril Lagasse, Wolfgang Puck, and Martha Stewart, who have all been fêted at prior events. Samuelsson is the acclaimed chef behind Red Rooster Harlem, Ginny’s Supper Club, and Streetbird Rotisserie. A committed philanthropist and the youngest person to ever receive a three-star review from The New York Times, he has won multiple James Beard Foundation Awards including Best Chef: New York City, and was tasked with planning and executing the Obama Administration’s first State dinner. He was also crowned champion of television shows “Top Chef Masters” and “Chopped All Stars,” and served as a mentor on ABC’s “The Taste.” Samuelsson co-produces Harlem EatUp!, an annual food and culture festival launched in Harlem, New York in 2015, and is also the founder of the website Food Republic. He is the author of Marcus Off Duty: The Recipes I Cook at Homecookbook and The New York Times best-selling memoir Yes, Chef, as well as the young adult version, Make It Messy. His newest book, The Red Rooster Cookbook: The Story of Food and Hustle in Harlem, was released in October 2016. He opened Marcus at MGM National Harbor outside of Washington, D.C., in December 2016, and most recently Red Rooster Shoreditch in East London. In May 2016, he was inducted into the James Beard Foundation Who’s Who of Food and Beverage in America. 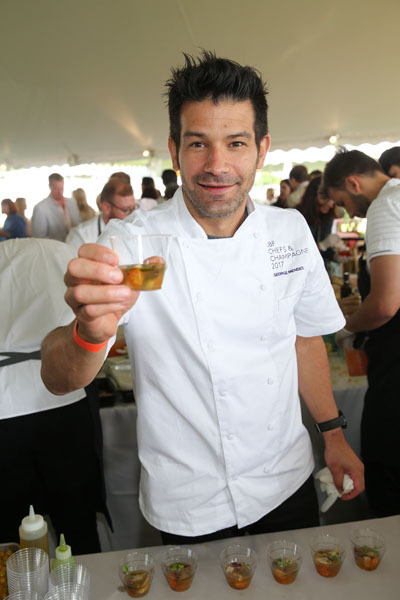 Sponsors for the James Beard Foundation’s Chefs & Champagne include Wölffer Estate Vineyard (host venue); Champagne Barons de Rothschild (exclusive champagne); Neuman’s Kitchen, Events & Catering (VIP after-party); Alfredo Prodotti, Audi, Big Green Egg, Brewery Ommegang, FreshDirect + FoodKick, Gokokuya, Hamptons.com,Hamptons Magazine, KAMUT®, Melissa’s® Produce, The Ritz-Carlton Residences, Miami Beach, Royal Cup Coffee and Tea, Saratoga Spring Water, Tito’s Handmade Vodka, VerTerra Dinnerware, Windstar Cruises, and WVVH.